Today’s photo represents today’s hi-tech part of this post. 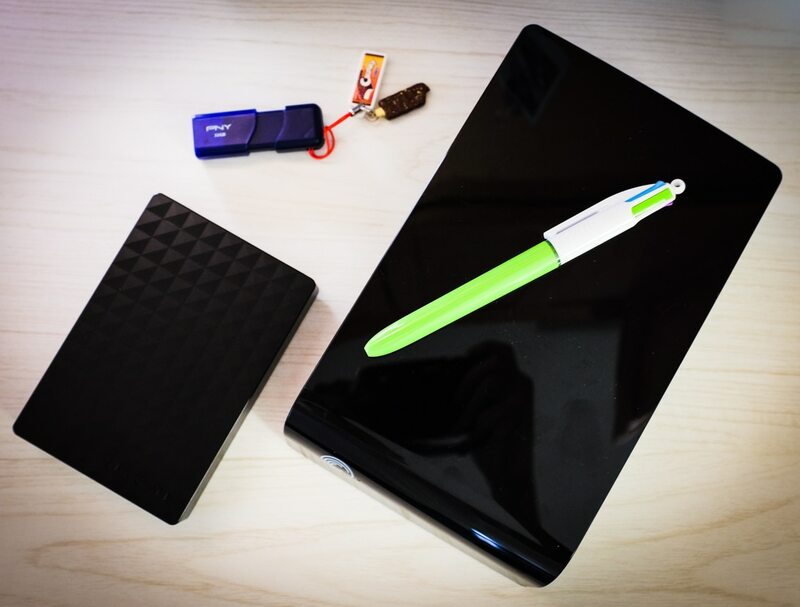 It’s a top down view of some digital storage – the large hard drive is an older 2TB unit that we’ve had for a few years, the smaller hard drive is a brand new Seagate Portable 3TB unit, and the smallest item is a 32GB USB thumb drive. Now for the lo-tech part of the post. Our kitchen sink got clogged way down past the elbow joint and I spent a couple hours trying to fix it. I removed the elbow joint and stuck our plumbing snake pretty far (about 15 feet) but it didn’t seem to hit any clogs, so we’ll have to call a plumber tomorrow.